User warning: The following module is missing from the file system: imce_dir_man. For information about how to fix this, see the documentation page. in _drupal_trigger_error_with_delayed_logging() (line 1156 of /mnt/www/html/brandonratzeachvoicecom1/docroot/includes/bootstrap.inc). User warning: The following module is missing from the file system: imce_file_path. For information about how to fix this, see the documentation page. in _drupal_trigger_error_with_delayed_logging() (line 1156 of /mnt/www/html/brandonratzeachvoicecom1/docroot/includes/bootstrap.inc). User warning: The following module is missing from the file system: imce_search. For information about how to fix this, see the documentation page. in _drupal_trigger_error_with_delayed_logging() (line 1156 of /mnt/www/html/brandonratzeachvoicecom1/docroot/includes/bootstrap.inc). Find pictures from IEEE ISPCE 2014 here. We hope you enjoy them! Thank you for making ISPCE 2014 a success. Join us in Chicago for the twelfth annual ISPCE. Visit the website here. The Conference4me smartphone app provides you with the most comfortable tool for planning your participation in ISPCE 2014. Browse the complete program directly from your phone or tablet and create your very own agenda on the fly. The app is available for Android, iOS and Windows Phone devices. To download the mobile app, please visit http://conference4me.eu/download or type 'conference4me' in Google Play, iTunes App Store or Windows Phone Store. On behalf of the Santa Clara Valley Chapter of the IEEE PSES and indeed the entire PSES, I would like to invite you to the center of where it all began - Silicon Valley! Yes - this is where the PSES got its start and the first time since then that the Symposium has been back. We're coming back, but we are looking forward with some changes to the Symposium that we hope you will like. San Francisco – Theater, Museums, Cable Cars! We have a great venue as well, the DoubleTree by Hilton San Jose, right next to the San Jose International Airport and the local Light Rail system that will allow you to get to and from the event easily for the locals who will be attending and also allow for visitors to easily explore the attractions in the area. The symposium will consist of several technical tracks where you will have the opportunity to learn some of the latest with respect to product compliance – see the technical program for the various tracks that will be offered. We will have not only one, but two Keynote addresses by leaders of two of the most innovative companies in Silicon Valley! We will also have a number of exhibitors consisting of organizations who offer services and products directly related to our field of interest. We will also have some demonstrations including one by an award winning local High School FIRST Robotics team. You will get the opportunity to spend time networking with leaders in our field. Additionally, many certifications held by our members require engineers to obtain continuing education to maintain their licensure. Attendees can, in many cases, use participation in our various tracks/sessions as suitable evidence of such continuing education. Spread the word to your colleagues. You might even want to check with your employer about sponsoring your attendance – what you learn here not only supports your individual professional development but it will help you bring more to your work as well. They may even want to sponsor some of your co-workers as well since what you learn will be directly applicable to your work! We hope you are as excited as we are and we can’t wait to see you there! Because of the location of the event this year, and along with a larger number of exhibitors and papers/presentations we are expecting see a lot more PSES Members as well as many others who are interested in what we do this year. 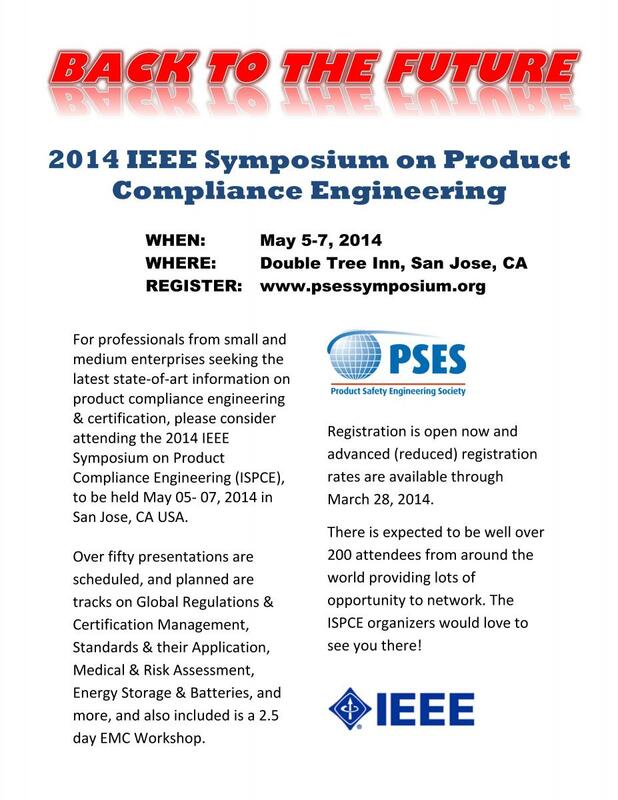 **We welcome all Exhibitors to be a part of the 2014 Symposium in San Jose, California. If you are interested in becoming an Exhibitor, please download the Exhibitor Contract.